As Orbea's dedicated race horse… or marine mammal, the Orca occupies their revamped geometry and fit philosophy. The phrase "race geometry" can often produce assumptions of merely a steeper head angle and a smaller wheelbase. As these are true in the Orca, but Orbea didn't stop there. The distances between axles drop allow for a snappier bike that take corners with ease and has exceptional footing when you standup out of the saddle and kick, which conserves both time and power at the same time. Additionally, Orbea's sizing system puts a heavy emphasis on stack and reach, versus the much more common effective top tube measurement. Stack and reach are more truthful measurements because they define the spatial relationships of two important contact points between your body and the bike; pedals and handlebars. Stack is the vertical distance from the center of the bottom bracket to the top of the headtube. Reach is the horizontal distance from the center of the bottom bracket to that same point at the top center of the headtube. Orbea's logical sizing allows the Orca to accommodate a wider range of riders and aligns with a more linear size progression. A lower stack and longer reach give the Orca a more aerodynamic position that's consistent across all size options for a more efficient use of energy for short riders, tall riders, and any rider in between. The Orca M20 Team model features Orbea's OMR (Orbea Monocoque Race) carbon fiber construction, which represents Orbea's top tier frames. It utilizes the most the most meticulus blend of high-modulus, low and standard carbon fiber to reach an optimum balance of performance, durability, and weight. This works out to create an ultra lightweight frame with a veracious appetite for racing. Pair the race-hungry OMR carbon fiber Orca frameset with Shimano's Ultegra R8000 11 speed mechanical drivetrain, FSA's cockpit build, and Mavic's ultra reliable Ksyrium Clinchers, and you've got a lightweight and aggressive steed that'll see you through the offseason base miles and then happily toe the line come early spring. 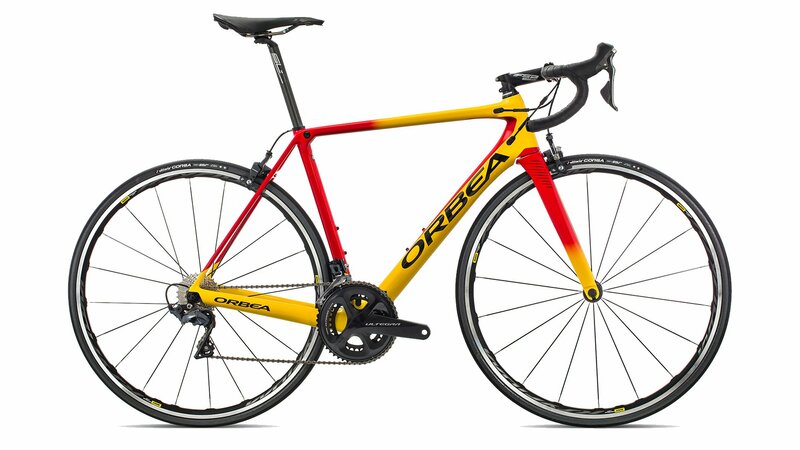 Orbea Orca carbon OMR, monocoque construction,tapered 1-1/8" - 1,5", BB 386mm, powermeter compatible, internal cable routing, EC/DC compatible, 27,2mm seat tube. Orca OMR carbon fork, full carbon steerer, tapered 1-1/8" - 1,5", carbon dropouts.